As you can see and hear, the cleanup continues at North Albany County Park after the harvest of scores of ailing and dead Douglas firs. Meanwhile, Benton County is getting ready to unveil its concepts for updating the 22-acre park and dealing with the nearby 10-acre wooded parcel newly donated by the developer of the adjacent Albany Heights subdivision. The county parks department has called a community meeting for Oct. 13 to get reaction to “new draft concept plans for the North Albany County Park and Natural Area.” It will be from 6 to 7:30 p.m. that night in the cafeteria at North Albany Middle School. 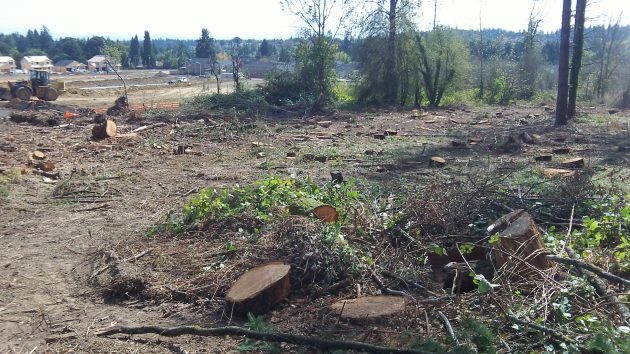 A Philomath logging company completed the cutting of diseased trees last week, and the park was reopened to the public. But on Thursday a good deal of slash remained to be cleaned up. Jeff Powers, director of the county’s natural areas and parks, wasn’t sure Friday how many trees ended up having to be taken down. Before the project started, there was talk of more than 100. A worker for Buena Vista Arbor Care told me Thursday he was grinding 60 stumps. The logging was made necessary in order to get rid of dead and drying trees lest they conk park visitors on the head or do other damage when they eventually fall down. Douglas firs all over the Willamette Valley have been showing signs of distress, generally blamed on a combination of drought and bugs. 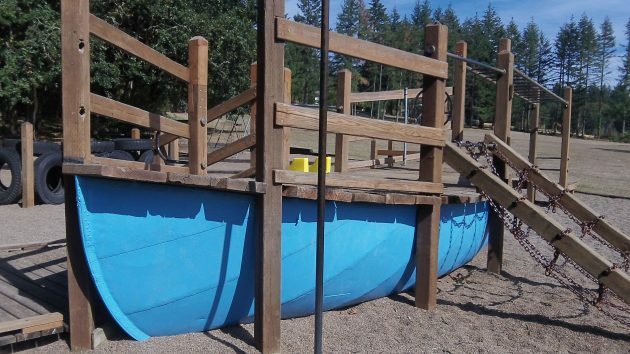 I’m hoping this nautical part of the playground survives the park planning. Near the park’s eastern edge, adjacent to a new subdivision.